The word advent means the arrival of a notable person, thing, or event and as Christian, it means the coming of THE most notable person in our lives: Jesus. As a Christian mother and now grandmother, Debby wants to encourage parents and grandparents to pass to the next generation traditions to celebrate this season of advent, Jesus' birthday. 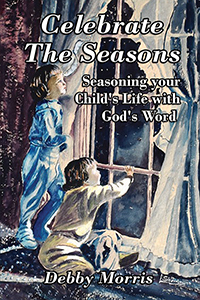 In her first book, Celebrate the Seasons, Debby wrote about the importance of allowing God to be in every season of a family's life, giving many ideas in how to do that. 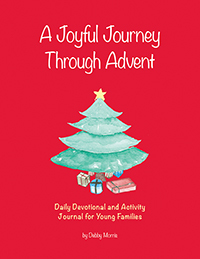 In A Joyful Journey Through Advent she now examines one important season and gives the reader a working journal of Scriptures and questions to ponder, along with activities and traditions to choose from every day of advent. This book can be used each year to open and record traditions and journal thoughts and prayers each day of December. Let's begin the joyful journey. Debby Morris is a speaker, teacher and writer of preschool curriculums. She has served on the Angel Ministry prayer team for Anne Graham Lotz, is a leader in Bible Study Fellowship, teaches 3 year olds in Sunday School with her husband and has her own decorating consulting business. 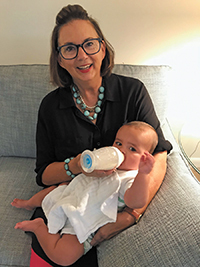 She lives with her husband, Tom in Savannah, Georgia and they are now grandparents to Julian Thomas.